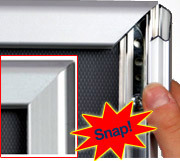 Snap Frames : This clip frame stand will get your advertisements noticed! 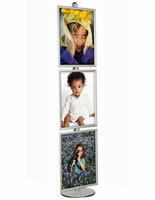 With this clip frame display stand, you can present six posters, signs or advertisements at the same time! 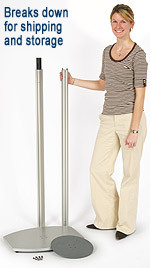 Standing 8ft tall, this standing poster holder is a great display fixture for busy venues and popular events. Because it is a double-sided display with three snap frames on each side, you will be able to attract attention from all directions. Place one in your retail store or lobby to advertise your company, products, services or special promotion. This clip frame display stand is constructed of an 8ft aluminum pole, heavy metal base, and six snap-open poster holders. Each poster holder has an easy-to-use, snap frame design that makes changing your contents a cinch! Unlike sign holder displays that load from the back, these poster frames do not have to be removed from the stand to change your contents. Simply lift open the sides of each frame, insert your poster or sign, and snap the sides down. We sell each sign holder with a clear lexan cover to reduce glare and protect your contents within. Although this clip frame display stand is 8ft tall, it is a steadfast unit that will not wobble or fall over. With a base weighing over 20lbs, the stand is difficult to move unintentionally. This clip frame display stand also comes with black plastic "feet" at the base to prevent your floors from being scratched when you decide to move it. Despite its large size, this clip frame display stand is easy to put together with two sets of hands. Each pole has grooves along the sides that allow you to adjust each snap frame to any appropriate height. To attach your frames to the main display pole, begin at the top and slide the connectors (fixed to the back of each piece) along the grooves in the pole. After positioning your frames where you want them, just tighten the screws and you are ready present your posters! The display stands come with wall screws to give you the option of using the frame as a wall display. These screws are not necessary for assembling your display stand otherwise.